How does music of the future sound like? Don't get killed by mere curiosity. 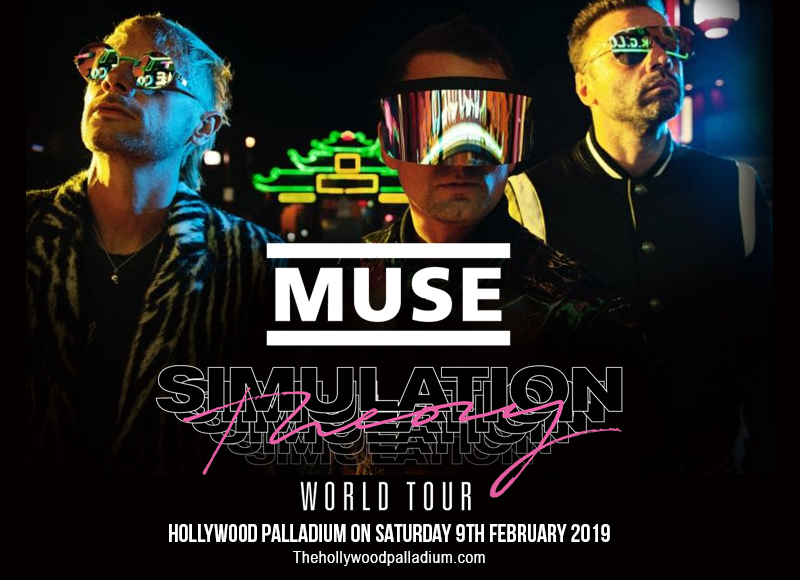 Be there and experience being launched into another dimension as apoco-rock band Muse is due to slay it onstage at the Hollywood Palladium on Saturday 9th February 2019. In support of their new album "Simulation Theory", Muse will take on the live stage with hits their massive hits like "Supermassive Black Hole" and "Uprising". Fans are now getting busy and won't stop at nothing until they get their hands on those in-demand tickets. Don't be left behind and wallow in the past. Get a ticket to ride to the futuristic soundscapes of Muse. Mindblown. That's the simplest word to describe a Muse concert experience. “We’re going to do the biggest tour and just blow people’s minds with stuff they’ve never seen before," says frontman Matt Bellamy. "We’re always interested in the latest technology and what’s cutting edge, so we’re always thinking of the new thing that nobody’s ever used before in a concert. And we found something and we’re going to use that.” And that's your cue to book a concert ticket to catch Muse and satisfy that nagging curiosity as to what Muse has in store for fans eagerly anticipating their "Simulation Theory" tour. The band is comprised of Matthew Bellamy, Christopher Wolstenholme and Dominic Howard. They were in separate bands back at the Teignmouth Community College, before they came together and formed Muse in 1994. Prior to global fame, they paid their dues doing the rounds of local gigs. It honed them into a hard-working and forward-looking band that managed to get them into top-tier venues. Their immense talent and their ever-evolving sound propelled them into a leading rock outfit. Their super spectacular live act gave them two Brit Awards for Best Live Act, then their explosive sound evolution took home three Grammy nominations and a win for Best Rock Album. Their now-mammoth following and reputation make them one of the biggest and most influential forces to hit contemporary rock music.